View More In Crutch Handgrips. Squares Crutch grips fits standard wooden and aluminum crutches from 4 ft 3 in. and taller. Buy a pair of Squares covers for crutches for the handles of your crutches. Our Squares crutch handle pads are a functional and fun accessory. You can mix and match with our black and black crutch bag and our Squares Crutch Cap crutch pads for a complete package to reduce your crutch pain.Features. Thick high density body contoured latex free foam crutch pads. Extremely light weight. Quick and easy installation. Just wrap and go. Crutches padding to eliminate crutch pain. 100 percent made in the USA. Covers for crutches that protect against germs and bacteria left by previous owners. Affordable price Point. 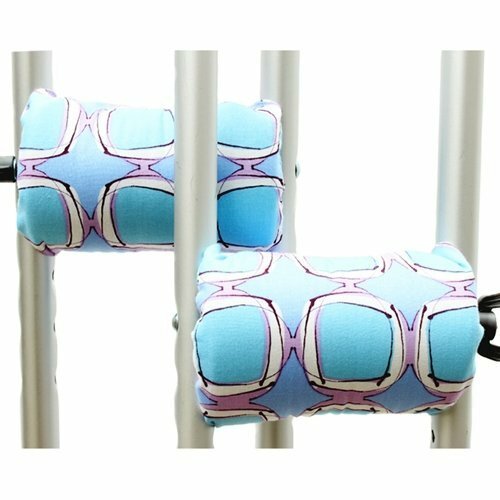 Fashionable and fun fabric for all of our crutch accessories. 100 percent more comfortable than standard crutches. Machine washable for easy care and cleaning. Material - Cotton based fabric High density latex free foam Hook and Loop. Dimension - 7.25 x 4.5 x 1 in.. Item Weight - 3 Ounces. Size - Adult and Junior crutch handle pads. If you have any questions about this product by Crutch Caps, contact us by completing and submitting the form below. If you are looking for a specif part number, please include it with your message.